Just over a year ago, after Bitcoin had just retraced from it’s all time high, I naïvely bought my first Bitcoin and ; a mechanism of social order that governs the behavior of individuals within a community. By using a form of money to represent value, specialization of labor became possible. For instance, an excellent woodworker could just focus on doing what he’s best at instead of also needing to maintain a farm or make clothes, even being able to save if he adds more value to the overall community than he consumes. Over the past few centuries, gold literally became the ‘Gold Standard’ to be used as money. Commodities like gold and silver were used to mint coins that had a certain weight, thus representing a certain amount of value. While this commodity money was more practical as a unit of account, it could also be tampered with, as coins were clipped or depreciated. In 1875, economist William Stanley Jevons described that as a result, representative money in the form of bank notes arose. These ‘gold certificates’ represented a certain amount of gold that was being stored in banks. Under the assumption that these banks could be trusted to store the same amount as gold as was represented in certificates, representative money was a good store of value and a convenient medium of exchange, as it was easier to carry around. In 1944, during World War II, representatives from 44 countries agreed on a monetary system known as the Bretton Woods system. Countries participating in the system agreed to settle their international accounts in dollars, that could be converted to gold at a fixed exchange rate of $35 per ounce at the United States government. As a result, the US dollar became the world’s reserve currency and the value of all other currencies were denominated in dollars. Due to the advantageous position of the United States in this system, the French referred to it as ‘America’s Exorbitant Privilage’. In the years shortly after World War II, this system worked well. However, due to a negative balance of payments, growing public debt due to expenses during the Vietnam War and monetary inflation by the US Federal Reserve, who started to spend more money than they carried gold in their reserves, the dollar became increasingly overvalued in the 1960’s. In the early 1970’s, some European countries left the Bretton Woods system and redeemed their dollars for gold, further increasing inflation and unemployment. In 1971, United States president Richard Nixon presented a set of economic measures known as the ‘Nixon shock’ that included decoupling the dollar from gold. As a result, the dollar became fiat money (after the Latin term fiat, which means ‘let it be done’), a currency without intrinsic value that is regulated by a government. Today, just about every national currency in use is a form of fiat money. How is fiat money created? After decoupling the dollar from the gold standard, Nixon was quoted saying “I am now a Keynesian in economics”. What Nixon referred to here is a macro-economic theory called Keynesian economics, that describes a set of measures for policy makers to stabilize the fluctuations in the business cycle. To limit unemployment during a recession, Keynesians think it is best for governments to lend money (quantitative easing) and spend it on public infrastructure. It believes this influx of money will then spread throughout the economy, basically ‘kick-starting’ it. The most obvious way to create an influx of new money into the economy is to just create new money. 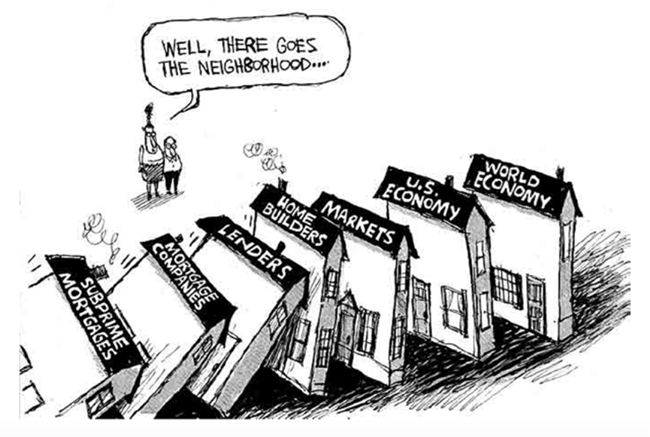 Only Central Banks (e.g. the Federal Reserve in the United States or the European Central Bank in Europe) are allowed to physically create new money by minting coins or printing banknotes. Central Banks then distribute this new money to governments or to private banks that distribute it further across the economy. 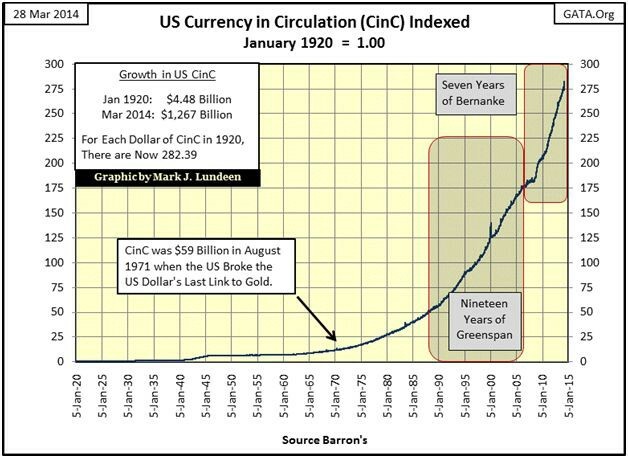 This influx of new money may result in inflation, since the purchasing power of the currency decreases over time as it becomes less scarce, threatening its function as a long-term store of value. However, new money (although technically; credit) also starts to circulate in the economy due to fractional-reserve banking, which is the norm for most banking systems throughout the world. 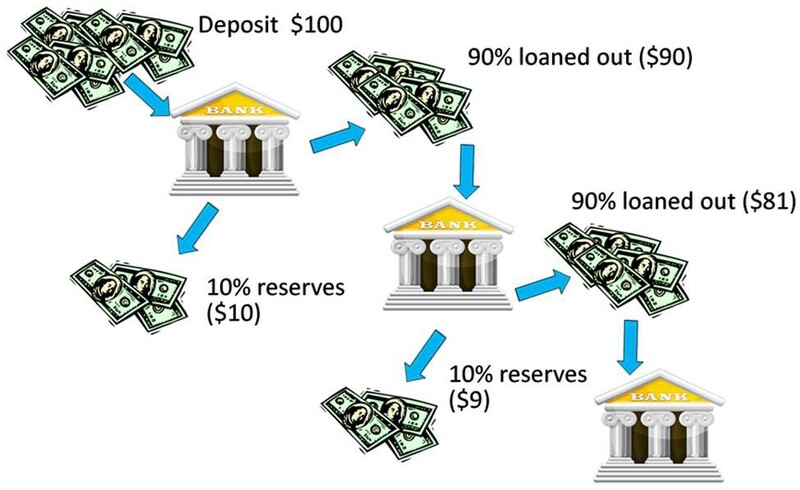 Contrary to full-reserve banking, in fractional-reserve banking a bank is only obliged to hold a certain fraction of the total amount of money that they credited to lenders in their reserves. Therefore, the creation of only a small amount of new money by a central bank or amount of money added to a savings account can result in much larger amount of money being added to the circulation within an economy. The weakness of fractional-reserve banking is that it relies heavily on the assumption that not everybody will need to access all their money at the same time, and thus trust in the system. Once people do lose faith in the system and collectively want to withdraw more money than the bank holds in its reserve, it may collapse. This phenomenon is known as a bank run. Several bank runs occurred during and after the 2007–2008 financial crisis. While it is impossible to point out a single cause for this crisis, it is clear that subprime lending played a significant role in the beginning. Subprime lending means lending money to someone that may have difficulty to repay the loan in time. During the subprime mortgage bubble, people lent money to buy houses because they speculated on its prices to increase, creating a bubble. Due to banks lending some people more money than they should to buy houses that were already overpriced, the delinquency rates rapidly increased. To make matters worse, banks had also packaged these debts into more complex financial products (e.g. mortgage-backed securities and collateralized debt obligations) that they sold to government agencies and investment banks. As a result, a domino-effect of debts that couldn’t be paid off arose and financial instruments were depreciated, severely impacting the world economy. The destabilization of the world economy then further cascaded onto the 2009 European debt crisis. Several European countries (Greece, Portugal, Spain, Ireland and Cyprus) were not able to refinance their governance debt or bail out over-indebted banks that were in trouble due to a bank run. To prevent entire countries from going bankrupt, destabilizing the European Union (EU), the EU and European Central Bank stepped up as a lender of last resort and unrolled multiple emergency measures. The Keynesian economic model and the neo-liberal economic model that followed it up in the 1980’s helped to massively increase the annual gross domestic product (GDP), a measure for the value of all goods and services produced each year. However, it also came at the cost of vastly increasing national debts. 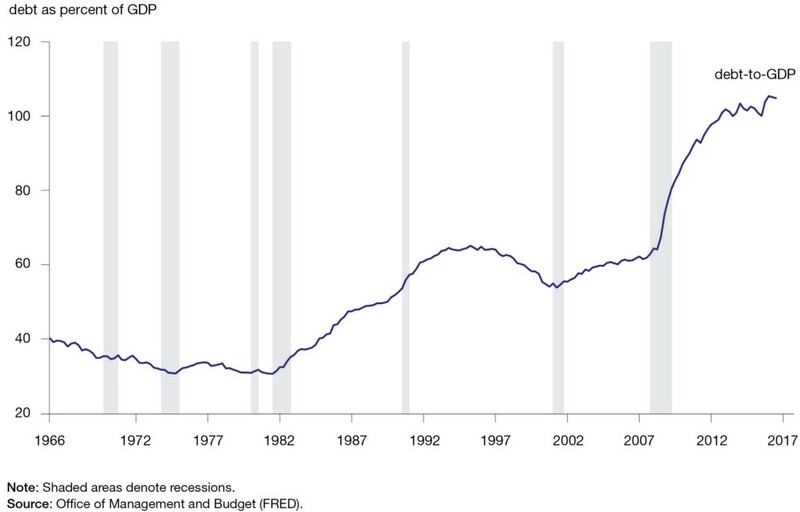 Particularly worrisome is that after the monetary crisis of the 1970’s was over, the United States’ national debt has grown more than the GDP, illustrating the national debts are gradually becoming unsustainable. Critics like the popular former US presidential candidate Ron Paul believe the current system is a bubble that will pop if it doesn’t return to the gold standard. While Paul is a proponent of gold-backed currencies, he views cryptocurrencies like Bitcoin as an interesting alternative. How does Bitcoin differ from fiat? On October 31st, 2008, in the heat of the 2007–2008 financial crisis, an anonymous person or a group called Satoshi Nakamoto released a whitepaper titled “Bitcoin: A Peer-to-Peer Electronic Cash System”. As the title suggests, Bitcoin was envisioned to be a form of digital money that could be sent from one person to the other without going through a financial institution. In the whitepaper, Nakamoto defined an electronic coin as a chain of digital signatures and described how it could run on a decentralized network of nodes using a consensus mechanism based on clever incentives. Just the thought of being able to send digital money from one person to the other without mediation of a trusted third party, making it censorship-resistant, is mind-blowing by itself. However, there’s more. One of Bitcoin’s main economic properties is that it’s supply is capped at 21 million, meaning there will never be more than 21 million coins in existence, creating scarcity. To incentivize network growth (bootstrapping), initially 50 new Bitcoins were minted every time a new block was created. 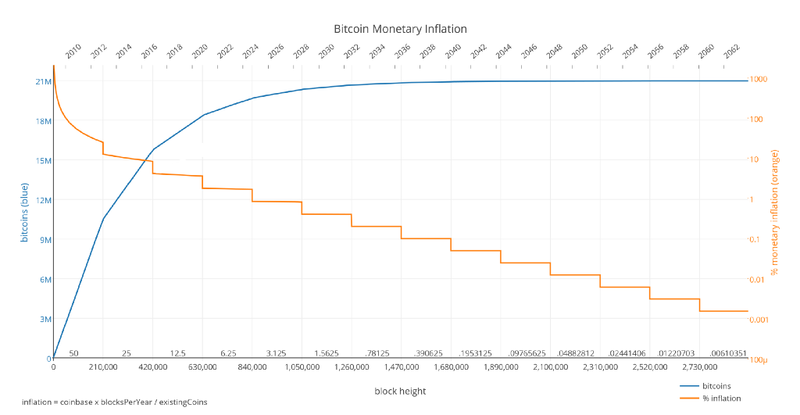 After every 210.000 blocks (~4 years) this ‘block reward’ halves, meaning Bitcoin’s monetary inflation decreases over time, which is called disinflation. 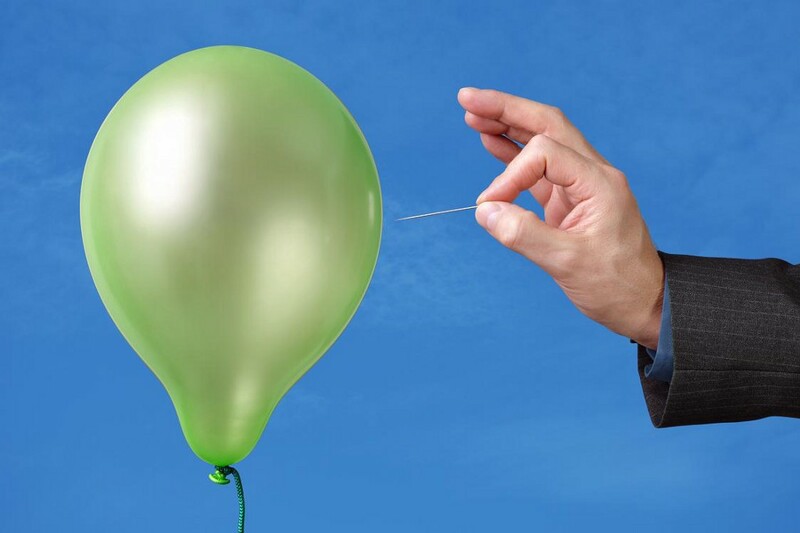 The actual circulating supply could even be considered to decrease over time (deflation), as access to many Bitcoins was lost due to loss of private keys. At the time of writing, 83.11% of Bitcoins maximum supply has already been created and its annual inflation rate is 3.84%. After the next halving, which is expected to be ~May 25th, 2020, its monetary inflation rate drops to 1.80%. Due to the built-in scarcity, Bitcoin is seen as a form of ‘digital gold’ by its proponents, suggesting it could potentially be ideal money to eventually become the next stable monetary standard (‘The Bitcoin Standard’). While Bitcoin’s price has been very volatile, the assurance that the monetary inflation rate will not increase unexpectedly contributes to it being seen as a ‘hard currency’ or ‘sound money’, as it helps retain purchasing power over time. For instance, hyperinflation like the bizarre 1 million percent annual inflation rate that Venezuelans currently experience is less likely happen in Bitcoin due to its monetary policy. To retain purchasing power over time, the asset’s price should also stay at least equal to the price it was bought for. So, what determines an asset’s price? The answer to that question depends on which economic theory you adopt. The classical school of economics that was dominant throughout the 18th and 19th century states that price is determined by the objective costs of production. In Bitcoin’s case, someone explicitly adopting the classical school’s vision might argue that price would depend on the costs related to the mining of blocks (e.g. hardware, electricity). In 2018, mining farms were shut down as Bitcoin’s price decreased, making the costs of production higher than the value gained and thus unprofitable in the short-term, showing there’s merit to this idea. However, there are also miners consciously mining at a loss because they anticipate Bitcoin’s price to rise again in the future, hinting price doesn’t solely depend on production costs. While the traditional classical school’s theory anticipates price to follow production costs, in this example of Bitcoin, the permitted production costs actually follow its price. According to neoclassical economics, which followed up on the classical school of economics and popular in the 20th century, price is determined by the equilibrium of supply and demand. In Bitcoin’s case, where its supply will only marginally increases (it is almost perfectly inelastic), means it almost completely depends on its demand. When demand is high, prices rise, when demand is low, prices decline. The Austrian school of economics, that originates in the late-19th and early 20th century and saw a revival during the 2007–2008 financial crisis, rejects the classical and neoclassical views on price discovery. It beliefs that the costs of production are also determined by subjective factors based on value of alternative uses of scarce resources and that the equilibrium of demand and supply is also determined by individual preferences. The Austrian school emphasizes he importance of scarcity and the avoidance of governmental interference. The Austrian school therefore contrasts with the current economic model that is actually based on monetary inflation and governmental regulation. Since Bitcoin shares these same characteristics, the Austrian school has become popular among Bitcoin backers and vice versa. Besides being able to retain purchasing power over time, money must be able to be reliably saved, stored and retrieved to be considered a store of value. At the time of writing, the Bitcoin network has been online for 10 years while being functional for 99.98% of it, but still faces challenges in becoming easy to store, use and to sell in large quantities if needed, particularly for non-technical people. If user interfaces improve over time, more custodial solutions become available, liquidity improves, and the network simply abides resiliently despite attacks, its monetary evolution will gradually continue. Bitcoin was the first cryptocurrency that drew widespread attention. Since then, many other cryptocurrencies have been created, for instance to adjust the technological or economic properties of Bitcoin or add features (e.g. more flexible smart contracts). 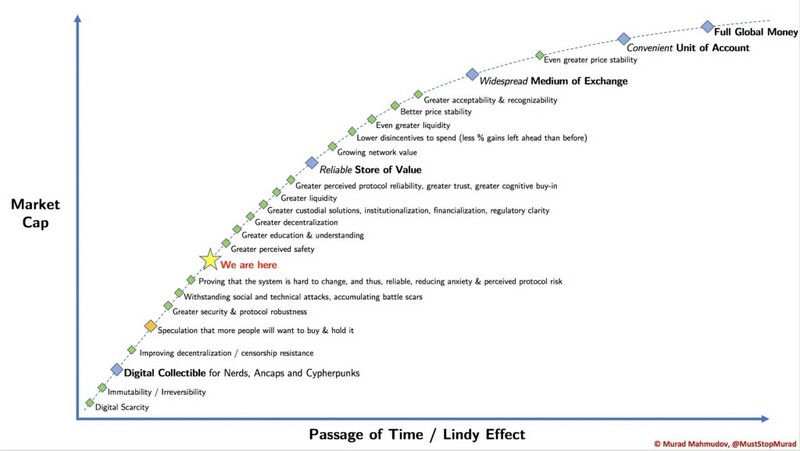 Due to Bitcoin’s first-mover advantage and Lindy effect, that states a technology’s remaining life expectancy is proportional to its current age, other cryptocurrencies must significantly improve on Bitcoin in order to trump its built-up network effect. Bitcoin was the on-ramp into cryptocurrencies for most people, and is the most used base pair to be traded against. While explaining all differences between cryptocurrencies is beyond the scope of this article, two economic theories that have emerged due to the evolution of cryptocurrencies will be discussed. The fat protocols thesis was first described by Joel Monegro in 2016 compares the value accrual of the traditional internet to that of blockchains. It states that the internet produced immeasurable amounts of value, but when it comes to value distribution, it is composed of ‘thin’ protocols and ‘fat’ applications. Nobody owns open-source internet protocols (e.g. TCP/IP, HTTP, SMTP, etc. 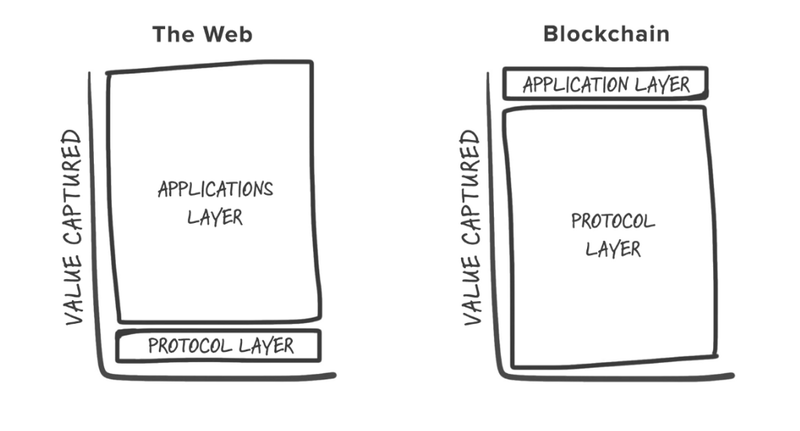 ), whereas these protocols allowed applications to scale immensely (e.g. Google, Facebook, Amazon), helping them capture value. For blockchains the fat protocols thesis beliefs is the other way around. Unlike traditional internet protocols, owning the native assets (e.g. Bitcoin or Ether) is necessary to use blockchain protocols. Therefore, it states adoption of blockchain protocols will increase the demand for these tokens, thus increasing their value. Successful adoption of the applications built on these protocols would automatically also increase the demand for the assets of the underlying blockchain protocol, increasing the value of the underlying protocol. The fat protocols thesis therefore states that the value accrual of the blockchain protocol will always grow faster than the combined value of the applications built on top of it. Usually, a cryptocurrency that can operate independently is referred to as a ‘coin’ (e.g. Bitcoin, Ethereum) whereas one that relies on another cryptocurrency as a platform to operate on is called a ‘token’ (e.g. Augur, 0x). Tokens are often sold in order to raise funds (an ‘Initial Coin Offering’, ICO), used as a proprietary currency within a blockchain application and/or are a digital representation of an asset (e.g. a software license, virtual asset in a game or equity). Particularly during the 2017 bull cycle, tokens became very popular, as thousands of tokens were created and and saw enormous increases and drops in price. Value accrual in the context of the fat protocols thesis therefore particularly refers to such tokens. The token velocity problem describes a problem with the assumption that if a coin or token’s supply is fixed, an increase in demand will automatically increase its price. The token velocity problem suggests that a network’s average value depends on its total transaction volume in relation to the velocity of which transactions occur. Simply put, this means that coins or tokens that people want to hold will accrue more value than tokens that people consider to be useless and will hastily get rid of. For instance, people may hold Bitcoin because they anticipate on it to eventually become global money. Under that assumption, just holding Bitcoin for the long-run is logical. If many people insist on not selling their coins as a result, the available supply is low and a small increase in demand may already cause a significant uptick in its price. However, in the situation where people receive a coin or token that they perceive to have less chance of retaining purchasing power than an available alternative, they’re likely to immediately sell it for that available alternative. Particularly tokens with only a very specific utility (e.g. proprietary application tokens) and coins or tokens that are known to undergo monetary inflation over time are described to be at risk of such a faith. There is no consensus on a single theory that describes what gives cryptocurrencies — or even money in general — value. However, the notion that value is a relatively subjective feature of an asset and mostly depends on the anticipated (future) demand for the asset, appears to be clear. Also, the prospect of having a censorship-resistant, digital form of money with a predictable monetary inflation has enthused many as a potential alternative to the current economic system, regardless of the economic theory that one adopts. Whether cryptocurrencies can actually evolve into an alternative form of global money that can be utilized by the general public in a way that is both convenient and secure remains to be seen. If it turns out they actually can, things might get really, really interesting. Related articles recommended for further reading: “The Bullish Case for Bitcoin” by Vijay Boyapati and “A deductive valuation framework for cryptocurrencies” by Alexander Liegl and Hasu. Finally, I want to thank Hasu, Nic Carter and Murad Mahmudov for their valuable feedback. Liked this story? You can follow me on Medium and Twitter. Disclaimer: The information in this article is for educational purposes only and should not be treated as investment advice. The author owns cryptocurrencies (BTC and ADA) at the time of writing. What gives cryptocurrencies value? was originally published in Hacker Noon on Medium, where people are continuing the conversation by highlighting and responding to this story.